The days are growing longer, little green things are springing up all around, and though there’s still a chill in the air, I’m moving ever-so-gradually toward lighter meal preparations. Take this salmon. It’s MSC Certified Wild Alaskan Sockeye, so richly flavored, that it really needed little adornment to make it shine. But I did want to do something more than just salmon, green beans and carrots, so I put together a sauce. 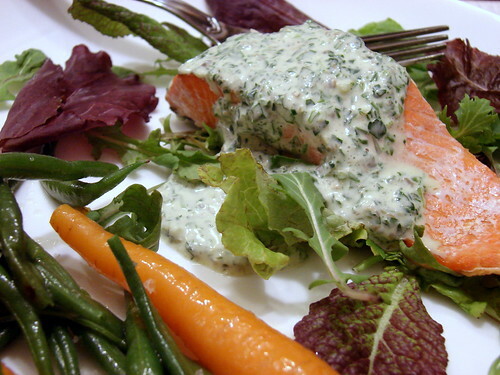 It was inspired by the classic Green Goddess dressing, but since I lacked a few of the primary components of the standard version, I’d call this more of an anchovy and herb sauce. 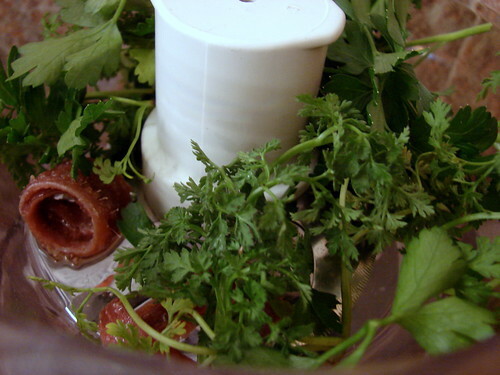 I combined a mixture of anchovy filets, garlic cloves, capers, lots of flat-leaf parsley, chervil, dill and young sorrel leaves in the small bowl of my food processor, added a pinch of salt and the juice of a Meyer lemon, and processed it to a slightly chunky paste. In a separate bowl, I whisked together a couple of ounces of creme fraiche with a heaping tablespoon of mayo, then I added the herb paste and stirred it until combined. I placed the sauce in the fridge to chill briefly while I sauteed the salmon, rubbed with a small amount of olive oil, searing it on all sides and taking it off the heat while it was still just a bit underdone in the center. I scattered some young leaves from Baby Greens on our plates, placed the salmon on top, and topped each piece with a drizzle of the sauce. 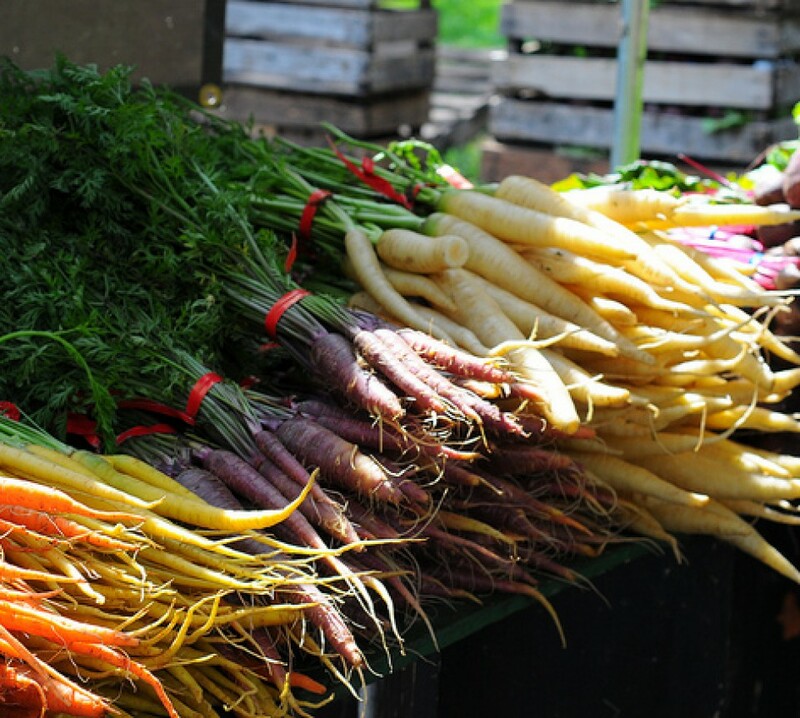 Some sweet young carrots from Ledge Ends Produce, along with the last of the haricots verts I froze last summer, went alongside. In essence, this was a simple meal of fish and vegetables, but the easy, flavorful sauce added a nice bit of elegance and flair. Just lovely, Jen. I never see chervil, though my mom grew it always. Where did you buy it? The sauce looks gorgeous. I think the best way to get creative in the kitchen and create new recipes is when you just don’t have all the ingredients on hand. Sometimes it backfires though, in my case. The sauce looks good but I have one question: anchovies + capers isn’t a bit too salty? Did the cream mute the saltiness? Marie – Thank you! This chervil was harvested from our Baby Greens salad mix – they include lovely large sprigs of fresh herbs in it – but I know that I was able to buy it fresh in NYC as well. Greenwich Produce at Grand Central Market used to carry it in little pouches, I recall. heather – Thanks and cheers! 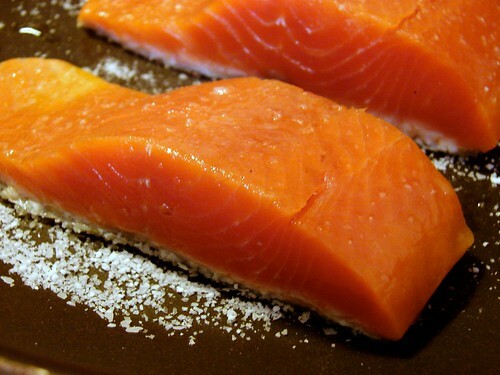 What a gorgeous photo of the finished salmon… this recipe sounds absolutely delicious. Love the fresh, spring vibes this brings! Oh dear that sauce looks amazing! How I wish I had a place to buy great fish. NJ is a wasteland for great fish. NYC is a good half hour, but then I have to park, pay tolls and it seems like a big effort. 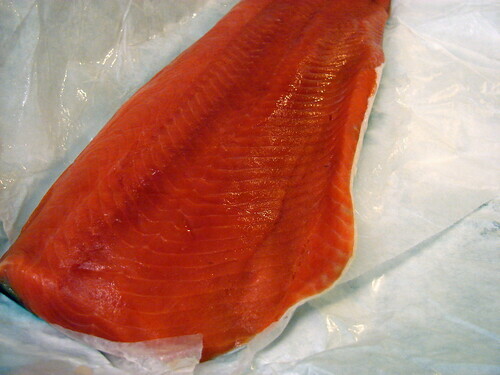 I need to do mail order salmon from Pike’s Market in Seattle! Now that would save me nothing! I am going to make your green goddess/anchovy version sauce for mother’s day!